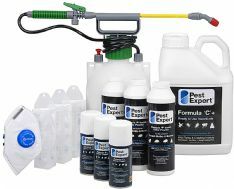 Carpet Moth Treatment is actually a simple process when you have the correct Carpet Moth Spray and associated products. Below you will find detailed information advising you on how best to carry out a carpet moths treatment. 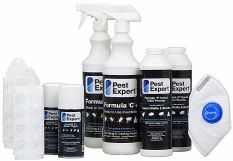 In terms of products required, best results are achieved by treating affected areas firstly with residual insecticides such as Pest Expert Formula 'C' Carpet Moth Killer Spray and Formula 'P' Powder. 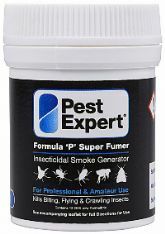 The activation of Formula 'P' Foggers to fumigate an area is also an integral part of a carpet moths treatment as they will kill off any carpet moths in either hard to reach areas, or ones that are not a ground level where carpet moth sprays and powders are applied. Once completed, as a follow-up to carpet moths treatment and to maintain carpet moth control, we would also recommend assembling Demi-Diamond Moth Pheromone Traps to a treated area to continually monitor activity. If your carpet moth infestation is in a bedroom, Rentokil Moth Killer Cassettes and Strips are also ideal for protecting garments in drawers and/or wardrobes. 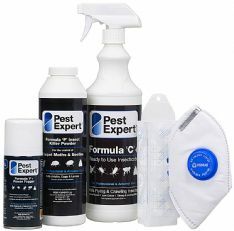 Highly recommended for any comprehensive carpet moths treatment are our Carpet Moth Killer Kits. These contain all of the necessary carpet moth control products, including moth killer spray, along with an advice sheet giving step-by-step instructions on how to carry out a professional carpet moth treatment. To order from or to see our full range of carpet moth treatment products, please click here or on the Carpet Moths tab at the top left of the page. Do not apply liquids directly to any electrical items or power source, being sure to avoid plug sockets, cables etc. Insecticidal dusts can safely be applied with caution around these areas. Treatment should be carried out by firstly applying the Rentokil Insectrol Powder, followed by the Formula 'C' Spray, and then the activation of the Formula 'P' Fogger(s), before finally placing Demi Diamond Moth Traps in the affected rooms. 1. Any unprotected persons or pets (including fish) should be removed from rooms where carpet moths treatment is about to take place and kept out until surfaces become dry. The entire carpet should be vacuumed throughly in advance of treatment. 3. Once the powder has been removed, apply Formula 'C' carpet moth spray to affected areas or the entire carpet if activity is widespread. Move any heavy furniture and spray beneath. A heavier application of carpet moth spray should also be administered around the edges of the room (up to 50cm out from skirting boards/wall-floor junctions). This should save you the trouble of having to lift and treat beneath the edges of the carpet. 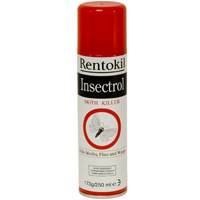 A 1 litre container will treat approx 20 sq m. NB Formula 'C' is a residual insecticide. This means it will leave an invisible film which, unlike a fine mist aerosol, will continue to remain effective for some time after (depending upon traffic over surfaces). Therefore, for maximum effect, cleaning / vacuuming of treated surfaces should ideally be avoided for a short time. After vacuuming it may be necessary to re-apply. 4. If carpets are being discarded, once removed, liberally apply Formula 'C' and repeat process if infestation has been moderate to heavy. 5. Next, place the Fogger in the centre of the area to be treated. Activate by tearing off the plastic seal, pushing down on the trigger and twisting to lock into place. As the gas is released under high pressure, please hold the canister away from you. The Fogger will take approx 90 seconds to empty its contents. Each Fogger will treat a room of approx 4m x 4m). 6. Close the room and allow 2-3 hours for surfaces to dry and for the gas to disperse. Upon re-entering the room, ventilate by way of an open window, if possible, to eliminate any fumes and help speed up the drying process. 7. To monitor activity after treatment, install Demi-Diamond Moth Pheromone Traps in the affected rooms. Fold the moth trap(s) into a toblerone shape and insert a pheromone pad into the holder, sticky side facing out. Replace pads every 8-10 weeks. 8. 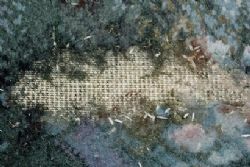 Depending upon the degree of carpet moth infestation, a repeat treatment may be necessary after 30 days. To see our full range of carpet moths treatment products please click here.